The cause of the current financial crisis in the U.S. is not the subprime real estate market, but the Iraq war. President Bush inherited a $128 billion budget surplus from Bill Clinton. During the Bush administration, the national debt has increased by more than 65 percent, to over $10 trillion. The U.S. is now saddled with the cost of two wars. 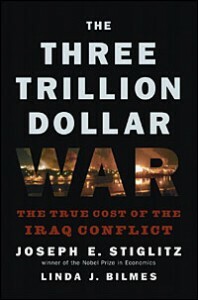 According to Nobel Prize winning economist, James Stiglitz, the price tag for the Iraq war alone will exceed $3 trillion or sixty times the Bush administrations initial estimate of a mere $50 to $60 billion. This is a bit more for the “want of a nail,” but the analogy still holds. Ignoring the cost of the Iraq war, the blame for the current state of the U.S. economy is mistakenly laid at the feet of “subprime” mortgages. This is not to say that there is no subprime mortgage crises. It is an effect of the current downturn in the U.S. economy – not the cause. The subprime mortgage crisis was caused by the decline in U.S. housing prices – the so-called “housing bubble.” Compared to housing costs in other first-world nations, U.S. housing prices were not out of line. Home prices in 12 developed nations from 1990-2007 increased much more than in the United States. Ireland, the Netherlands and Great Britain lead the list. Apartments in Singapore, and Italy commonly cost over $1,000 per square foot – far above the average, even in the most affluent U. S. neighborhoods. President-elect Barack Obama said on January 6, 2009 that foresees a $1 trillion U.S. deficit soon and “for years to come” as the nation climbs out of its economic crisis. As much as the incoming Obama administration wants to spend this amount of money, it will not be feasible. Currently, the U.S. national debt stands at $10.6 trillion, or at $35,000 for every man, woman, and child in the U.S. Another $4 trillion for a first Obama term will bring that to $14.6 trillion or $48,000 per capita for the U.S. This does not include for the cost of continuing the wars in Iraq and Afghanistan. Obama assumes the Iraq war will come to an end in less than two years. Unfortunately, if the U.S. pulls out of Iraq, the void will be filed by Iraq’s Iran-backed Shias. This will be unacceptable, and the U.S. may find its presence in Iraq necessary to maintain the current balance of power in the Middle East. The funds to support the U.S. national debt, like the funds for the wars will have to be borrowed. Who will lend us that amount of money and on what terms? The terms, including the interest rate, will not be acceptable to the U.S.